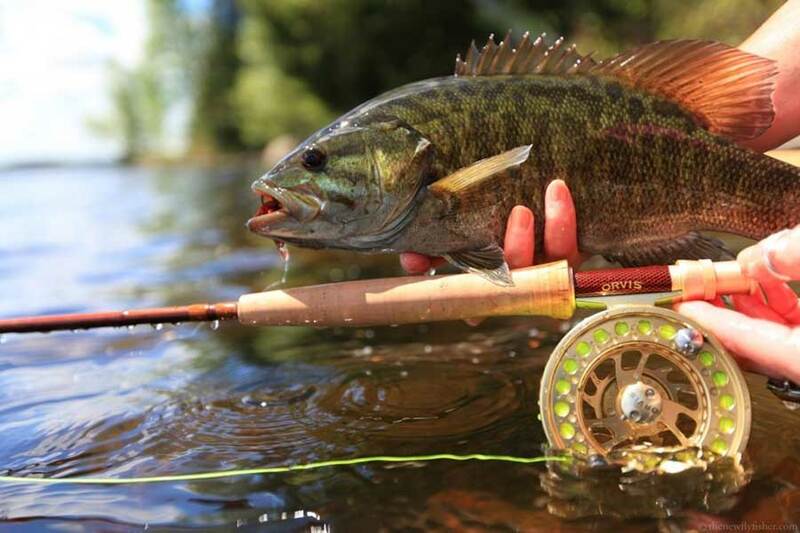 Catching large northern pike or big smallmouth bass is always a thrill but catching them on a fly rod and fly…. that is the ultimate experience. That is why I am always in search of new locations that have trophy-sized fish. 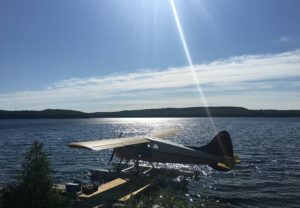 For years I have heard about the famous Rainey Lake located in Northwestern Ontario, only 25 miles from the Minnesota border. This large lake is renowned for consistently producing massive fish. Camp Narrows Lodge, which is located in the northern part of Rainey Lake, has been in business for over 30 years and knows these waters exceptionally well. This was the perfect place for a fly fisher to base a trip to explore this large lake and locate some big pike and bass on a fly. I am visiting in early June and the large northern pike are cruising small bays, reefs and emerging weed beds. I am casting relatively large streamers into the shallows. It does not take long before I am into my first large pike, a 41-inch female that hammered my large orange & black streamer. Initially, this fish followed my 5” streamer several times to the boat but would not take. So I switched to an 8” version of the same fly and that did the trick. Over a day and half of casting, I landed three fish over 40 inches and multiple pike in the 30-inch range. What is unique about these pike is how thick and heavy they are. 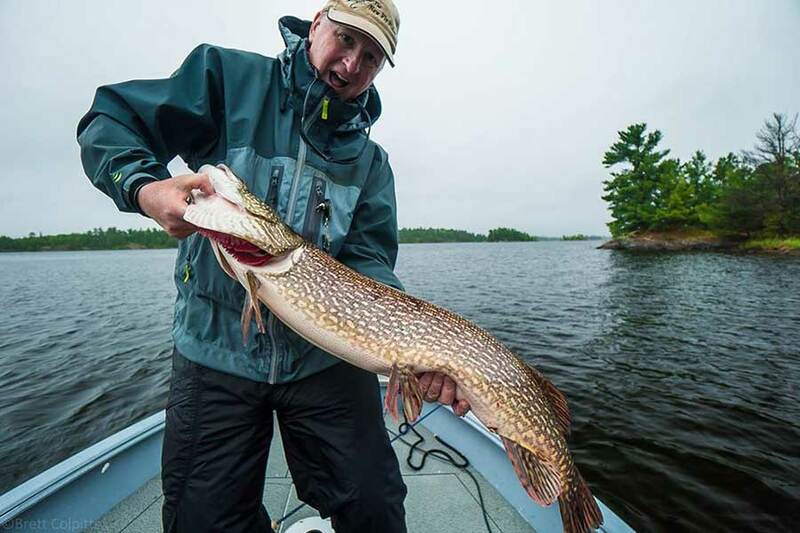 A pike that is 41 inches in length weighs well over 20lbs. 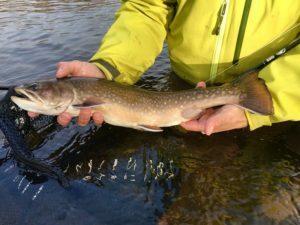 On my second day, a large pike that took a streamer in less than four feet of water was exceptionally strong and ran me into the backing three times before we got her into the net. Don’t believe people that say pike do not fight well – they do here in the cold waters of Rainey Lake! For the last two days of my trip we focused solely on smallmouth bass. The fish were not yet spawning and were actively hunting for food. Using weighted woolly buggers in black, brown and olive worked well when fished slowly near the bottom. The bass were not relating to a specific structure at this time and were generally in small schools of 4-6 fish cruising around looking for food. They were in four to eight feet of water. Minnows, crayfish and insect larvae (dragon fly nymphs) seemed to be the main items on the grocery list. 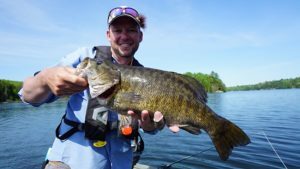 Like the pike, the smallmouth bass here are very fat and healthy. Average fish were 16” in length but we caught lots of 18-20” fish. The topwater action in June and into July is legendary on Rainey Lake. Fly fishers find that poppers in black, green/white and in yellow work best when twitched and popped slowly near rocky structure and fallen trees. Late day and early evening surface action is magical on a six-weight rod. 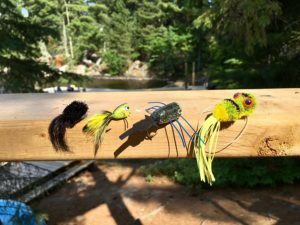 Owner Tom Pearson says that anglers coming to Rainey Lake get “fishing fever” because they are so excited about the size and quantity of large fish. In my four days of fishing here, I clearly understand what he is talking about. Each night as I lay in bed, it was hard to sleep because I kept thinking about the big fish to come the next morning. 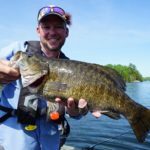 That is probably why Sports Afield magazine rated Rainy Lake among the top 4 lakes in North America for catching trophy-size smallmouth bass. 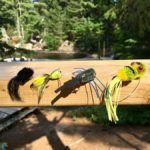 This is big fish heaven and ideal fishing waters for fly fishers because you can target trophy-sized fish in shallow waters. 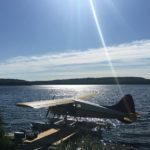 If you want to experience some of the best of northern Ontario fly fishing, then I strongly recommend you put Rainey Lake and Camp Narrows Lodge on your bucket list. 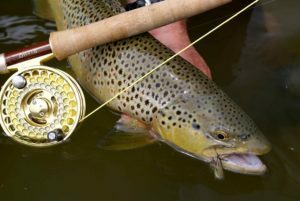 This is true fly fishing nirvana for those who love to catch shallow water big fish on a fly.